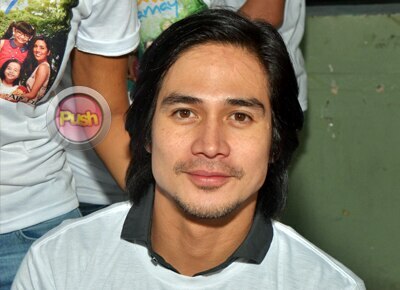 Piolo Pascual says he is thankful to be blessed with a new and challenging project. After his hit movie Starting Over Again, Piolo Pascual admitted he is happy to have the time to focus on his newest drama series which features him as a musician who becomes an instant parent to three children. “Dito muna focus ko Hawak Kamay kasi mahirap pagsabayin yung pelikula at saka soap. We've been listening to a lot of concepts for this Hawak Kamay. They pitched a lot of concepts before we actually landed this role so I guess it's okay naman to say that we want to choose kung ano yung puwede gawin para hindi ka rin ma-burn out,” he shared. The 37-year-old actor revealed he also shows off his singing skills on the show. “Yes I sang the theme song and I performed during the first day. Last taping day I sang, so may mga ganun. Pero siyempre it's not a musical show. I just play guitar and I sing, that's part of the show,” he added. Apart from Iza Calzado and Nikki Gil, Piolo is also joined by a younger batch of talented actors in Hawak Kamay like Zaijian Jaranilla, Xyriel Manabat, and Andrea Brillantes. Piolo said he is very proud of the family values the show espouses. “Dito pinapakita namin na hindi mo kailangan maging mag kamag-anak para hawakan mo ang kamay ng isa't isa. It's going to tackle more on adoption, how it is to be adopted, ano pinagdadaanan ng mga pamilya, yung guardians. Working with these kids it's amazing. Pinagsama-sama mo yung mga magagaling na bata dito eh so it's a nice. It's a delight to watch them perform because puro raw eh, as in wala kang tulak kabigin sa mga bata,” he admitted. During a recent Hawak Event charity day held recently at the Hospicio de San Jose in Manila, Piolo said he personally chose the venue for special reasons. “I've shot here before and I come whenever there's a chance so this is one of the orphanages that is closest to my heart,” he added. Piolo said there came a time in his life this year when he almost decided to quit showbiz entirely. “Ayoko namang sabihing mahirap mag-quit di ba, parang ang kapal naman ng mukha ko pero I think there's a time for everything. I was really considering quitting this year after my contract was going to expire kaya I was kind of emotional nung nag-victory party ng Starting Over Again. I guess it wasn't God's plan. It's not time yet and ABS-CBN has been nice enough to give me a new contract so that's why I'm here,” he said. The talented actor said he could not easily turn his back on all the people who believe in him. “I think more than that it was because of the support of my station, the support of the people around me. To be given this task of headlining a show, a movie, it's a blessing. But at the same time it's a responsibility na mahirap talikuran and I'm grateful for it,” he said. On the recent issue regarding Nora Aunor being passed over for a National Artist recognition, Piolo said the veteran actress does not need any major validation to be recognized as a true asset to the country. “I don't know how to react, with all her achievements I don't know if it's still needed. Kailangan pa ba natin gawaran ng ganun? Let the experience speak for itself, let her achievements or whatever recognition speak for what she's done, what she's been in this country. So yun na yun eh, hindi mo kailangan ng mga recognition or anything. We all know she's the superstar,” he explained.